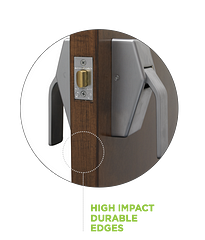 Whether you’re providing enhanced acoustics to ensure peace and privacy in patient rooms or greater durability to stand up to high levels of traffic in a hotel lobby — we have the right door solution for every opening. Our ongoing research provides you with the tools, resources and expertise to empower great designs for any market. As a result, you can confidently specify the right products for all your building’s aesthetic and performance needs. Good acoustics can create a better space to live, work and play. Acoustics is integral to the healing process in healthcare facilities, creates a better learning environment in schools, and provides an essential component to guest satisfaction in hospitality. In short, acoustics are a cornerstone of our ability to enjoy life. Acoustic doors are optimized to weaken airborne sound, which travels through openings with very little loss. 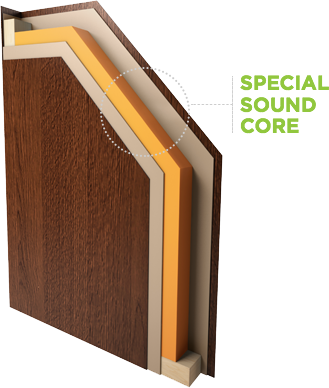 Our acoustic doors are tested in operable openings and rated with the gasket and seal packages as listed in Appendix M.
Strength and durability work from the core to the surface to ensure protection for those on the other side. Designs require craftsmanship to stand up to the elements in demanding environments. Designed to withstand heavy traffic, our laminated surfaced doors are built to last. High impact options can withstand the most punishing environments and include resilient edges that minimize damage to the face material. We also adhere to superior industry standards with constructions tested and built to WDMA, AWI and AWS performance duty level standards. Occupant protection considerations vary by environment. Ensure safety in every opening with options for fire-ratings, clean edges, lead lined cores or bullet resistant surfaces. Providing a safe and protected environment for occupants is every building owner’s goal. From fire-rated assemblies that meet life safety codes and radiation protection to privacy options and impact-resistant edges, our doors help meet the demands of specialty type applications in architectural and commercial buildings. Build eco-friendly environments with sustainable solutions. 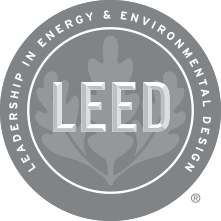 Environmentally responsible construction helps meet the requirements of sustainable building programs like LEED v4. Consumers connect with brands that reflect their values. 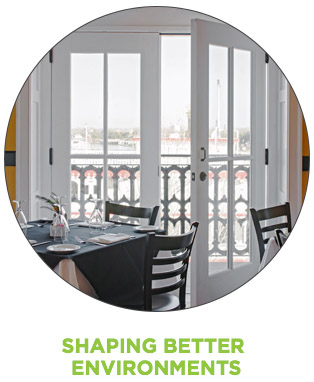 Sustainable doors ensure superior indoor air quality, support corporate environmental values and foster loyalty from today’s sustainably-minded guests. We offer eco-friendly door solutions and provide extensive third-party certifications to validate environmental qualities. At Masonite Architectural, we recognize that third-party certification is the key to your project’s success. Ensuring the validity of our environmental claims is why our doors are third-party certified as low-emitting through SCS Global Services’ SCS Indoor Advantage Gold certification program. Make a statement with natural beauty. Professionally crafted wood doors leave a stunning, lasting impression that help shape better environments. A door is a central fixture that can dramatically shape the built environment. Through the versatility of wood, you can customize a door’s style to enhance your project’s design from contemporary to traditional and everything in-between. We offer virtually endless design options and a wide array of exotic veneers and surfaces that will help you create a successful building. Our user-friendly, step-by-step cross reference guide helps you select the the right door type for your project needs.